This is an email that I received after letting one of my patients know that Calmare Pain Therapy for neuropathic pain was finally being offered in the San Francisco Bay Area by an MD Dr Susan Gutierrez in Danville and San Ramon areas. Here is the post from my one patient so far. I am also sending all my nerve patients to Dr Lee Wolfer now if I can get approval/insurance coverage to see her. My other favorite docs are Dr Michael Moskowitz and Dr Michael Savella in Marin County. Thanks to your recommendation. i'm asking because overall the CRPS pain is doing much better, thanks to dr. wolfer's dextrose nerve blocks since feb of this year.. these are done with ultrasound guidance. i've had blocks on my femoral nerve, sciatic nerve, sapenous nerve, and the most stubborn, oldest pain site - the tibial nerve. lee actually would love if you called her. she believes she can help some CRPS patients if you are open to talking with her, that is. Dr Blake's comment: Dr Lee Wolfer is an amazing pain specialist. Here are several links referring to her. In regards to my left big toe joint, i do the spica taping and cluffy wedge daily. and i walk in my orthotics all the time except when going to client meetings. i continue to scan the web for womens shoes with removable footbeds. my foot doesn't fit well into a lot of the brands. so i continue to search, order, and return shoes. anyway, this is a long update to say i'll hold off on seeing dr. gutierrez. but i will post her name on the facebook CRPS support group. should i get to a point where i was pre-february 2014 then i will definitely make a consultation. i'm spending so much money (~ $1,200/month easily cash) as it is. the thought of adding another cash consult/procedure overwhelms and stresses me even more. not to mention the added coordination and travel. i've tried four PTs, several MDs, three accupuncutirsts before landing on the multi-disciplinary team i have now. thanks again so much for thinking of me. i need to make an appt with you after i get my hands on my some shoes that fit my feet. 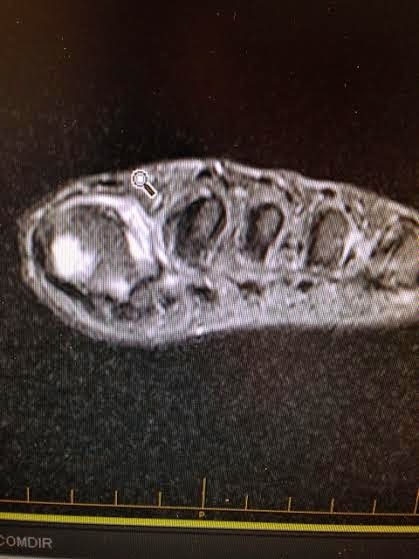 did my MRI show anything besides big toe joint OA and inflammation? 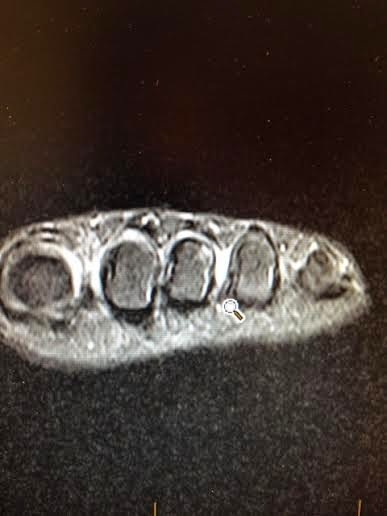 Here is the image of the left big toe joint on MRI. The sensor is along the second toe side. The fluid in the medial side of the first metatarsal signifies substantial bunion joint arthritis. No wonder the nerves around the big toe joint get upset and painful. 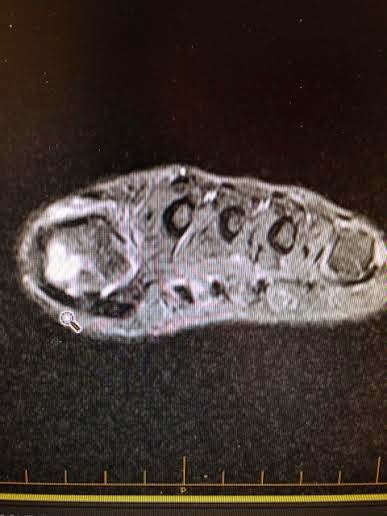 This MRI of the left foot focuses on the inflammation in the 3rd intermetatarsal space where a Morton's neuroma may reside. Definitely a cortisone shot can calm that down and prevent the nerve triggering. 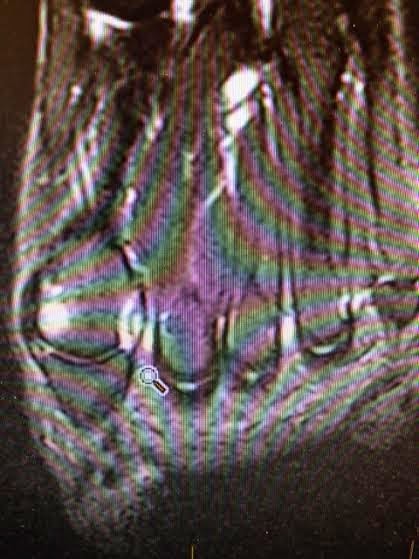 Another image of the big toe first metatarsal head. The white within the bone is not healthy. The sensor overlies swelling in the space between the first and second toe which irritates the deep peroneal nerve in that area. This is the second trigger of left foot nerve pain. 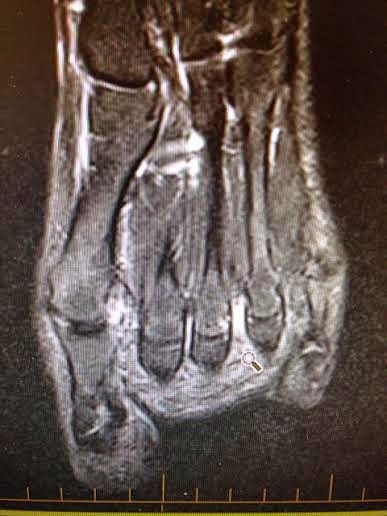 Here the image highlights the first metatarsal bone swelling on the bunion side of the joint. The swelling is plantar (bottom of the foot), making weight bearing hard, and making the spica taping, dancer's padding, Cluffy Wedge, and Hannaford orthotic devices crucial. This last image also highlights all the intense swelling right where the intermetatarsal nerve runs. This can produce Morton's neuroma symptoms without actually being a neuroma. Cortisone injections are considered for this. very thoughtful response, as always, dr. blake. i especially love how you educated me (and all the other readers of your blog) on what my MRI means. 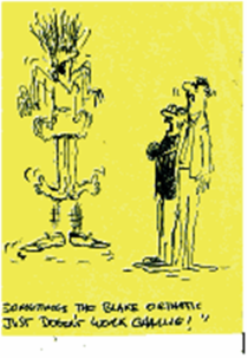 my body responds to the homeopathic remedies! my skin started itching as a result of the toxins trying to escape my system. interestingly enough, lee used to work in the same office as lee years ago! i also like my PT, rachel feinberg, in palo alto. she has 13 years experience in CRPS and tailors a functional restoration program for each patient. link is below, which also has her CV.